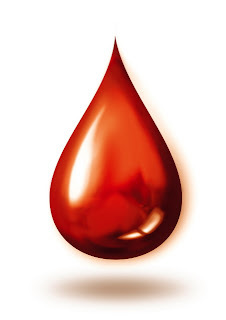 Blood is made up of liquid, called plasma, and various different types of cells. An average-size man has about 5-6 litres of blood in his body, a woman has slightly less. Blood has many different functions - detailed below. Blood is found in blood vessels. Blood vessels supply every part of your body. These include arteries, arterioles, capillaries, venules and veins. Blood is pumped through blood vessels by your heart. What is normal blood made up of? Red cells (erythrocytes). These make blood a red colour. One drop of blood contains about five million red cells. A constant new supply of red blood cells is needed to replace old cells that break down. Millions of red blood cells are made each day. Red cells contain a chemical called haemoglobin. This binds to oxygen, and takes oxygen from the lungs to all parts of the body. White cells (leucocytes). There are different types of white cells which are called neutrophils (polymorphs), lymphocytes, eosinophils, monocytes, and basophils. They are part of the immune system. Their main role is to defend the body against infection. Neutrophils engulf bacteria and destroy them with special chemicals. Eosinophils and monocytes also work by swallowing up foreign particles in the body. Basophils help to intensify inflammation. Inflammation makes blood vessels leaky. This helps specialised white blood cells get to where they are needed. Lymphocytes have a variety of different functions. They attack viruses and other pathogens. They also make antibodies which help to destroy bacteria. Plasma is the liquid part of blood and makes up about 60% of the blood's volume. Plasma is mainly made from water, but also contains many different proteins and other chemicals such as hormones, antibodies, enzymes, glucose, fat particles, salts, etc. Transport. Blood takes oxygen from the lungs to the cells of the body. It takes carbon dioxide from the body's cells to the lungs for exhalation. It carries nutrients, hormones and waste products. Regulation. Blood helps to keep the acid-alkali balance of the body in check. It also plays a part in regulating body temperature. Increasing the amount of blood flowing close to the skin helps the body to lose heat. Protection. White blood cells attack and destroy invading bacteria and other pathogens. Blood clots which protects the body from losing too much blood after injury. Blood cells are made in the bone marrow by 'stem' cells. The bone marrow is the soft 'spongy' material in the centre of bones. The large flat bones such as the pelvis and breast-bone (sternum) contain the most bone marrow. To constantly make blood cells you need a healthy bone marrow. You also need nutrients from your diet including iron and certain vitamins. Stem cells are primitive (immature) cells. There are two main types in the bone marrow - myeloid and lymphoid stem cells. These derive from even more primitive common 'pluripotent' stem cells. Stem cells constantly divide and produce new cells. Some new cells remain as stem cells and others go through a series of maturing stages ('precursor' or 'blast' cells) before forming into mature blood cells. Mature blood cells are released from the bone marrow into the bloodstream. B lymphocytes make antibodies which attack infecting bacteria, viruses, etc. T lymphocytes help the B lymphocytes to make antibodies. Natural killer cells which also help to protect against infection. All the other different blood cells (red blood cells, platelets, neutrophils, basophils, eosinophils and monocytes) develop from myeloid stem cells. You make millions of blood cells every day. Each type of cell has an expected life-span. For example, red blood cells normally last about 120 days. Some white blood cells last just hours or days - some last longer. Every day millions of blood cells die and are broken down at the end of their life-span. There is normally a fine balance between the number of blood cells that you make, and the number that die and are broken down. Various factors help to maintain this balance. For example, certain hormones in the bloodstream, and chemicals in the bone marrow called 'growth factors', help to regulate the number of blood cells that are made. The cells that make up the organs and tissues of your body need oxygen to live. They also produce carbon dioxide which needs to be removed from the body. 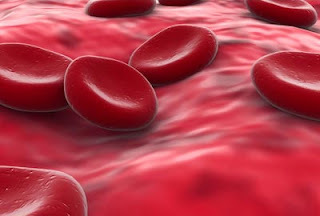 One of the main functions of blood is to transport oxygen and carbon dioxide around the body. A special chemical called haemoglobin is found inside red blood cells. Haemoglobin has a strong attraction to oxygen. Red blood cells pass through the lungs within the bloodstream. Here in the lungs the oxygen you breathe in passes into red blood cells, and binds to haemoglobin. Blood then flows from the lungs to the heart. The heart pumps blood around the body. When red blood cells come into contact with tissues that need oxygen, haemoglobin releases the oxygen it is carrying. Carbon dioxide produced by your body's tissues is also carried by blood. When it reaches the lungs it passes out of the blood vessels and into your airways. This allows carbon dioxide to leave your body when you breathe out. As well as transporting oxygen and carbon dioxide, blood carries many of the chemicals and nutrients essential to life. This includes the nutrients produced by the digestion of food, enzymes (chemicals produced by the body), hormones and waste products. Blood also helps to buffer all the different chemicals in the body. By doing this it stops your body fluids from becoming too acidic or too alkali. The main function of blood vessels is to transport blood around the body. Blood vessels are found throughout the body. There are five main types of blood vessels: arteries, arterioles, capillaries, venules and veins. Arteries carry blood away from the heart to other organs. They can vary in size. Arterioles are the smallest arteries in the body. They deliver blood to capillaries. Arterioles are also capable of constricting or dilating and by doing this they control how much blood enters the capillaries. Capillaries are tiny vessels that connect arterioles to venules. They have very thin walls which allow nutrients from the blood to pass into the body tissues. Waste products from body tissues can also pass into the capillaries. For this reason capillaries are known as exchange vessels. Groups of capillaries within a tissue reunite to form small veins called venules. Venules collect blood from capillaries and drain into veins. Veins are the blood vessels that carry blood back to the heart. They may contain valves which stop blood flowing away from the heart. What is a blood group? Red blood cells have certain proteins on their surface called antigens. Also, your plasma contains antibodies which will attack certain antigens if they are present. There are various types of red blood cell antigens - the ABO and rhesus types are the most important. These were the first type discovered. If you have type A antigens on the surface of your red blood cells, you also have anti-B antibodies in your plasma. If you have type B antigens on the surface of your red blood cells, you also have anti-A antibodies in your plasma. If you have type A and type B antigens on the surface of your red blood cells, you do not have antibodies to A or B antigens in your plasma. If you have neither type A or type B antigens on the surface of your red blood cells, you have anti-A and anti-B antibodies in your plasma. Most people are 'rhesus positive' as they have rhesus antigens on their red blood cells. But, about 3 in 20 people do not have rhesus antibodies and are said to be 'rhesus negative'. A+ (A positive) if you have A and rhesus antigens. A– (A negative) if you have A antigens, but not rhesus antigens. B+ (B positive) if you have B and rhesus antigens. B– (B negative) if you have B antigens, but not rhesus antigens. AB+ (AB positive) if you have A, B and rhesus antigens. AB– (AB negative) if you have A and B antigens, but not rhesus antigens. O+ (O positive) if you have neither A nor B antigens, but you have rhesus antigens. O– (O negative) if you have do not have A, B or rhesus antigens. There are many other types of antigen which may occur on the surface of red blood cells. However, most are classed as 'minor' and are not as important as ABO and rhesus. Within seconds of cutting a blood vessel, the damaged tissue causes platelets to become 'sticky' and clump together around the cut. These 'activated' platelets and the damaged tissue release chemicals which react with other chemicals and proteins in the plasma called 'clotting factors'. There are 13 known clotting factors which are called by their Roman numbers - factor I to factor XIII. A complex cascade of chemical reactions involving these clotting factors quickly occurs next to a cut. The final step of this cascade of chemical reactions is to convert factor I (also called fibrinogen - a soluble protein) into thin strands of a solid protein called fibrin. The strands of fibrin form a meshwork, and trap blood cells and platelets so that a solid clot is formed. If a blood clot forms within a healthy blood vessel it can cause serious problems. So, there are also chemicals in the blood which prevent clots from forming, and chemicals which 'dissolve' clots. So, there is a balance between forming clots and preventing clots. Normally, unless a blood vessel is damaged or cut, the 'balance' tips in favour of preventing clots forming within blood vessels. Anaemia means that you have less red blood cells than normal, or have less haemoglobin than normal in each red blood cell. There are many causes of anaemia. For example, the most common cause of anaemia in the UK is a lack of iron. (Iron is needed to make haemoglobin.) Other causes include lack of vitamins B12 or folate which are needed to make red blood cells. Abnormalities of red blood cell production can cause anaemia. For example, various hereditary conditions such as sickle cell disease and thalassaemia. Too many red cells is called polycythaemia and can be due to various causes. Too few white cells is called leucopenia. Depending on which type of white cell is reduced it can be called neutropenia, lymphopenia, or eosinopenia. There are various causes. Various infections can cause an increase of white blood cells. Certain allergies can cause an eosinophilia. Leukaemia causes a large increase in the number of white blood cells. The type of leukaemia depends on the type of white cell affected. Too few platelets which is called thrombocytopenia. This may make you bruise or bleed easily. There are various causes. Too many platelets which is called thrombocythaemia (or thrombocytosis). This is due to disorders which affect cells in the bone marrow which make platelets. Lack of vitamin K can cause bleeding problems as you need this vitamin to make certain clotting factors. Liver disorders can sometimes cause bleeding problems as your liver makes most of the clotting factors. A blood clot which forms within a coronary (heart) artery or in an artery within the brain is the common cause of heart attack and stroke. The platelets become sticky and clump next to patches of atheroma (fatty material) in blood vessels and activate the clotting mechanism. Sluggish blood flow can make blood clot more readily than usual. This is a factor in deep vein thrombosis (DVT) which is a blood clot that sometimes forms in a leg vein. Certain genetic conditions can make the blood clot more easily than usual. Liver disorders can sometimes cause clotting problems as your liver makes some of the chemicals involved in preventing and dissolving clots. If you have a blood transfusion, it is vital that the blood you receive is compatible with your own. For example, if you receive blood from a person who is A positive and you are B positive, then the anti-A antibodies in your plasma will attack the red blood cells of the donated blood. This causes the red cells of the donated blood to clump together. This can cause a serious or even fatal reaction in your body. So, before a blood transfusion is done, a donor bag of blood is selected with the same ABO and rhesus blood group as yourself. Then, to make sure there is no incompatibility a sample of your blood is mixed with a sample of the donor blood. After a short time the mixed blood is looked at under a microscope to see if there has been any clumping of blood. If there is no clumping, then it is safe to transfuse the blood.